One person killed in clashes in Cairo. Muslim Brotherhood claims police officers fired at their march. At least one person was killed and 11 others were wounded by gunfire in clashes between supporters and opponents of ousted President Mohammed Morsi in Cairo on Tuesday night. 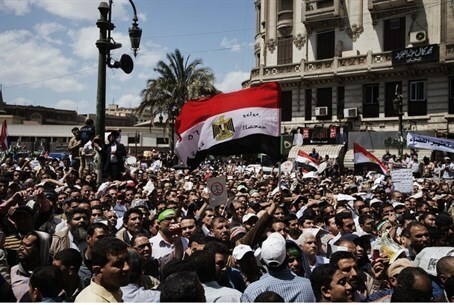 Al Arabiya reported that the clashes took place in al-Haram street, where Morsi supporters were marching in an evening rally. Another pro-Morsi rally was held in the evening at the upscale Maadi district and it was led mainly by women and children, according to Al Arabiya. The Muslim Brotherhood, from which Morsi hails, accused plain clothes police of firing on their march, causing the death of the protester. Supporters and opponents of Morsi had clashed earlier in a central Cairo neighborhood hurling rocks at each other as police fired tear gas. The violence began when dozens of religious scholars affiliated with Morsi’s Muslim Brotherhood entered the religious endowments ministry and were ordered out by police, a security official told the AFP news agency. The scholars were joined by more pro-Morsi protesters who damaged shop fronts, AFP reported. That further infuriated the residents, who pelted them with stones, leading to sporadic scuffles on several streets. The clashes spread to several streets and brought Cairo traffic to a standstill. Loyalists of the deposed president have set up two huge Cairo protest camps and have held near daily demonstrations for his reinstatement since his overthrow by the military on July 3. Security sources had said the interior ministry would begin an operation to break up the sit-in on Monday. Later reports, however, indicated that the operation was postponed because the media had made public that it would start on Monday. The protesters are bracing themselves for clashes with the military. The standoff with the army-backed interim government, which has threatened to disperse the protest camps where thousands of Islamists have been staying for more than a month, has sparked international fears of further bloodshed. Meanwhile, Egypt’s judiciary on Monday extended Morsi’s remand by another 15 days pending investigation into his alleged collaboration with Hamas. Morsi is accused of having coordinated prison breaks in 2011, in which prisoners and guards were killed during mass protests against the rule of then-President Hosni Mubarak. Dozens of members of Morsi’s Muslim Brotherhood group escaped from jail in these breaks.